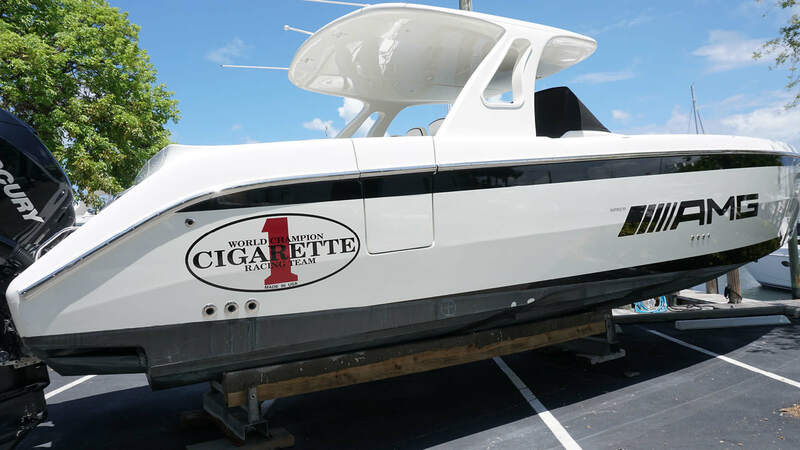 The 42′ Huntress exemplifies Cigarette’s determination to continually innovate and expand its horizons. By merging a performance hull with an entertainment-centric deck and cabin created a total lifestyle powerboat. The efficient hull propels this boat up to exhilarating speeds yet even with its gracious and spacious deck and lounge, the boat’s its extreme agility and easy-handling belie its size. The Huntress’ impressive and commanding silhouette with a generous 12′ beam, new deck, cockpit and full, luxurious cabin, shows the depth of design built into this performance center console. Adapted as a “walk-around” for easy access and efficient use of space, the configuration creates a flow so passengers can interact and enjoy all the leisurely appointments of this grandly planned powerboat. Quintuple Mercury 350 Verado engines provide extremely reliable power propelling her to a top speed of 77 Mph. Its twin-step, deep-vee hull efficiently and smoothly runs the water, while the lightweight, composite, structure and framework has been further refined, lowering weight and improving the balance. The hardtop follows the lines of the vessel, and the weight has been further reduced to lower the center of gravity. Twin steps aid easy on-plane acceleration and smooth running and the easy handling may surprise the first-time captain. All of the design and construction details of the Huntress combine to create the ultimate Cigarette – one with speed, technology, luxurious space and a commanding presence, on the water and at the dock. It is the next dimension of powerboating. The Huntress is specially outfitted to offer all the comforts for all your guests for your perfect day of performance boating and the freedom to explore the options.